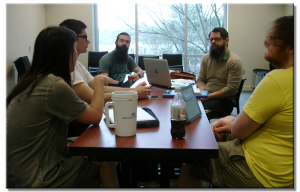 Become a Member of A4E! Imani Scott-Blackwell is a community organizer who says she will fight for “unprecedented radical change.” Athens is rich in cultural and educational opportunity, but many youth in our community don’t have access to these assets and are left behind or forgotten. The school board is too often seen as an apolitical organization, but it has the power to move Athens in a positive direction. We need school board members who will work to utilize university resources; mitigate the effects of low wages, joblessness, and homelessness; and defend black and brown Athenians, especially youth. Athens for Everyone is proud to endorse Imani for the Board of Education in District 5. Imani’s involvement with youth and education issues goes beyond her candidacy, and her presence at community events is more than a stop on her campaign trail. It is characterized by commitment, dedication and determination—always with a full heart—and her presence is accompanied by authenticity, fearlessness and endless inspiration—usually with a full smile. Imani attended community involvement sessions with new CCSD superintendent Dr. Demond Means, initiated a group tour of the ACC Jail and was a leader in the End the School-to-Prison Pipeline initiative as a member of the Athens Anti-Discrimination Movement (AADM)—all before deciding to run for the school board. She has attended school board meetings (with countless hours of research before and after), facilitated a Teen Lobbying Day with A4E at the Capitol in Atlanta, acted as a chaperone for teens on an AADM trip to Washington, D.C., for the March for Our Lives and remains accessible to the voters of District 5 through frequent open campaign events. Imani is the president of the AADM student chapter at UGA, and in January, A4E members voted her onto our Board of Directors (a position now on hiatus as she runs for office). She has been putting in the work to resist injustices since middle school, where as a 13-year-old she fought the establishment for the creation of a Gay-Straight Alliance. Imani’s opponent, Kara Dyckman, is active on the Chase St. School LSGT. She is serious, informed and shows a real commitment to supporting students and improving the district. But Athens’ youth need Imani’s willingness to speak up and her concrete vision for the future. She knows the policy, the bureaucracy and the possibilities for CCSD, and her fearless, transformative vision makes her the best candidate for the job. Imani will fight for the rights and the empowerment of marginalized students—those of minority backgrounds, low-wealth and un(der)documented households and those determined to have disabilities. Her specific proposals include school redistricting for greater equity and integration, increasing minority teacher recruitment and institutionalizing restorative justice methods. She believes in a responsibility to nurture the whole student because “students are not walking grade point averages, they are human beings.” She supports an Athens Youth Council as a platform for students to use their own voices. And she’ll push for all of this by striving to engage the whole community in conversation and governance. Vote Imani Scott-Blackwell for Board of Education District 5. Note: Imani was elected by membership to the Athens for Everyone Board of Directors in February, but stepped down to run for this seat. 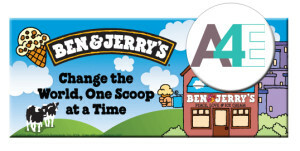 Ben & Jerry’s has graciously agreed to donate 20% of sales from 6-8pm on the fourth Wednesday of every month to A4E! Paid for by Athens for Everyone, Inc.
Not authorized by any candidate or campaign. Athens for Everyone works to advance social and economic justice for the Athens, Georgia community.